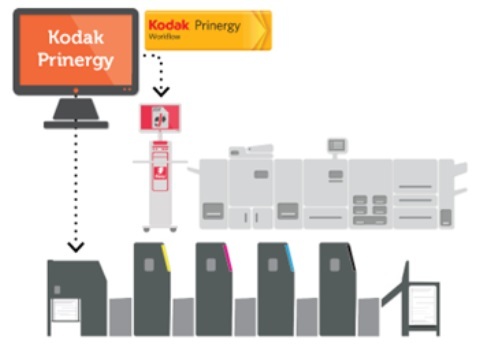 EFI Fiery and KODAK PRINERGY Workflow 7: Full end-to-end workflow integration. Kodak Prinergy With numerous successful installations at leading printing companies worldwide, integration of EFI™ (Nasdaq:EFII) Fiery® digital front end (DFE) technology with popular KODAK™ PRINERGY Workflow™ 5 and 6 solutions has helped users take advantage of best-in-class digital production automation. Now PRINERGY Workflow 7 users will also be able to take advantage of this opportunity, and PRINERGY Workflow 5 and 6 users will be able to upgrade, keeping the same workflow automation in place. This unique integration, which offers bi-directional JDF communication, helps printing companies seamlessly blend their digital printing operations into a PRINERGY Workflow prepress and production environment. "In this rapidly evolving print landscape, our relationship with EFI has been a critical factor in delivering essential workflow tools to printers eager for consistent, accurate and high quality print jobs," said Allan Brown, Vice President and General Manager, Unified Workflow Solutions, Kodak. "This partnership has been an essential part of Kodak's goal of providing innovative solutions for printers operating in hybrid offset and digital print environments." EFI's newest Fiery DFE platform, Fiery FS200 Pro, gives printing companies the ability to move even more work to digital. With the Fiery/PRINERGY Workflow integration, users can access the latest Fiery DFE capabilities, including HyperRIP, a key Fiery job acceleration technology, for 55 per cent faster job processing, advanced make-ready and colour management tools, right from the PRINERGY Workflow user interface. PRINERGY Workflow users also can take advantage of the wide range of complementary EFI workflow solutions - ranging from Web-to-print and MIS to shop floor data collection and more - from the print industry's leading portfolio of print MIS/ERP and workflow software products. EFI's Monarch and Pace™ MIS solutions and its Digital StoreFront Web-to-print offering are also integrated with PRINERGY Workflow. In addition, print shops with unique business needs can take advantage of the easy-to-use Fiery API (application programming interface) so that in-house developers can integrate their own custom applications or other third party solutions with their Fiery DFEs. "We are pleased to continue our partnership with Kodak and to drive advancements through integrated Fiery/PRINERGY Workflow production environments," said Toby Weiss, senior vice president and general manager, EFI Fiery. "Our longstanding commitment to Fiery/PRINERGY Workflow integration not only gives users the advantage of a single workflow management system for offset and digital cut sheet printing, it also gives them the ability to connect to a broader range of digital printers from all leading digital printer manufacturers." For more information about the productivity and profitability advantages available with Fiery Driven™ digital production printing and Fiery DFE integration with KODAK PRINERGY Workflow, visit www.efi.com.